Welcome to Mojoceratops emporium of material and virtual goods. Our currently in-print discography can be acquired from us or our associated secure sites. 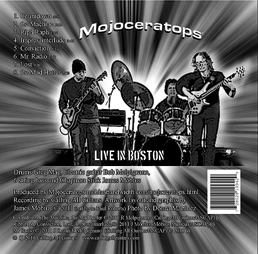 Mojoceratops on iTunes Live in Boston. 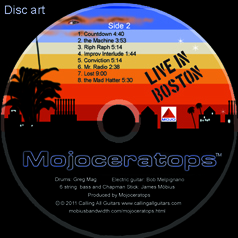 Mojoceratops on CD Baby.com Live in Boston. To purchase a physical CD from us directly, scroll down for details. To purchase CDs via mail, send a cheque or money order payable to James Mobius for $15.00 each, ($10 for the CD, $5 to cover US continental postage handling and mailer.) For orders outside of the continental US, and international orders, please email us with your address so we can calculate your postage. Send inquiries via mail in the USA (email us for the address), or email by clicking here. you can also pay via the secure PayPal button below after sending us your order via email, just send an email that says "please send me a copy of _____ (name of CD)", include your name so we'll know when your Paypal payment is processed who you are, and that you paid, and your address so we'll know where to send it. We'll be happy to sign CDs (for as long as feasible), just ask! New CDs Now available for direct purchase! 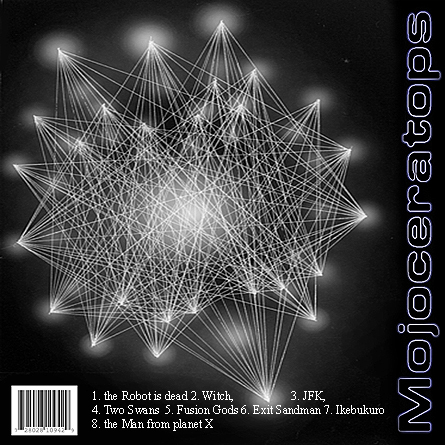 "Mojoceratops: M3" back in print due to popular demand, that's right! Studio recordings (not live). Greg Mag: drums, Bob Melpignano: guitars, James Möbius: 5 & 6 string bass, 5 string fretless bass, upright, and mandolin. "Mojoceratops: Trois Visages" an album of improvised music. Also back in print, now with 2 new bonus tracks! Greg Mag: drums, Bob Melpignano: guitar, James Möbius: 5 & 6 string bass, & keyboards. "Mojoceratops: Fusion Gods" Greg Mag: drums, Bob Melpignano: guitar, James Möbius: 5 & 6 string bass, & Chapman Stick. ©Mojoceratops/MobiusBandwidth.com 2011 all rights reserved.